8 p.m. to 9 p.m. – Joint Session with everyone in Prayer Hall after Isha at 8 p.m. with Shaykh Rami and Dr. Syed Amer Rahmatullah. Moderated by Ustadha Dr. Rania Awaad. 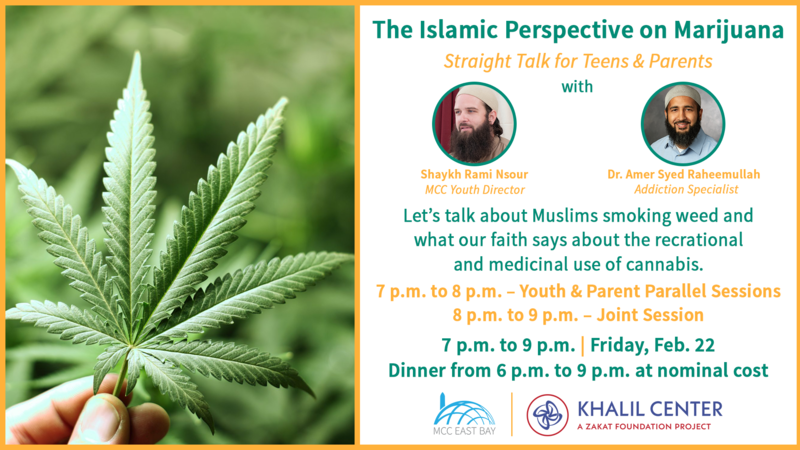 This talk, sponsored by the Khalil Center and the MCC East Bay, will address the anecdotal misperception by youth in our community that smoking weed is allowed (halal) because it is a natural, soothing herbal plant. All teens in the Navigators and Rahmah Friday evening halaqas will join this session, including all attendees of Dr. Rania’s womens halaqa and Shaykh Rami’s mens halaqa. The parent’s talks with Dr. Amer and the joint session moderated by Dr. Rania will be livestreamed and recorded. The private session with Shaykh Rami with the youth (13 to 23) will not be recorded or livestreamed and that session will be closed to adults to allow for a frank and honest discussion.